Stimson was a New York attorney and Republican politician who served during 1911–1913 as President William Howard Taft’s secretary of war. During the administration of President Calvin Coolidge, he was sent to Nicaragua to resolve unrest there and was also appointed governor general of the Philippines. 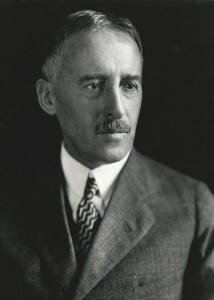 Stimson was President Herbert Hoover’s secretary of state from 1929 to 1933. In 1940, President Franklin D. Roosevelt appointed the Republican Stimson his secretary of war. Stimson served through World War II, continuing under President Harry S. Truman until his retirement after the war in September 1945. Stimson was a major influence on U.S. foreign policy during the first half of the 20th century.